For today, I have an interview with Michelle. Since Michelle is doing a lot of blog tours, though, I wanted to try and make my questions a bit different! I went back and looked at the other two interviews that I conducted with her and built from there. I hope you enjoy! 1. They say that the third time is the charm. I am not sure if that necessarily applies to published novels, but do you feel any differently about this book that you did about the other two? Actually, yes! Of all my novels, Cleopatra's Daughter was the most fun to write. The lighter approach I took to Roman history (meaning more conversation and action than my previous novels) and the fact that my characters were so young, made this an enormously fun novel to write. 2. You said in your interview last year that you didn't read Egyptian historical fiction because it didn't appeal to you. 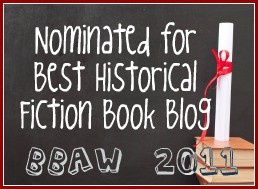 How about Ancient Rome historical fiction, or do you not read that either? When writing my first three books, I tried to stay clear of both Egyptian and Roman fiction simply because I didn't want anything to influence my research or my writing style. Now that my fourth book is on the French Revolution, I am delving into historical fiction set in the ancient world and loving every minute of it! 3. In a year that has seen a lot of controversy surrounding books and book blogging, how do you feel about it? You said last year that you owe a lot of your success to the blogosphere, would you still back that claim? I would definitely still make that claim. Bloggers have been such an enormous part of my publishing experience. I couldn't even fathom a book publishing world without them. 4. I am always curious about the deleted scenes, so like with your previous two novels, I have to ask if there are any deleted scenes from this one that you would like to share? Actually, there were very few deleted scenes this time. After having to trim 100 pages for my last two books, I wised up and made sure to stay in the 450 page range! 5. Do you feel confident with your move from Egypt to Rome, or do you think you might still have some Egyptian tales to tell in the future? I would never say never, but I'm pretty sure my time in ancient Egypt is done. I can certainly see myself returning to ancient Rome, but I doubt there will be a return to Egypt. 6. For those that you read my interview last year, they will know that I asked about the roses you mentioned in your author bio. Is the garden still thriving? Actually, I don't know! My husband and I sold our house recently with the intention of moving either to Virginia or France. Virginia is looking more likely right now, since my mother is in CA and the flight to France would be pretty long and torturous for her every year. We're giving ourselves until April to make a decision. Either way - I'm very excited! Virginia and France are two of my favorite places in the world, and wherever we end up choosing, we'll be spending a great deal of time in both paces I'm sure. 7. Now, for something completely different. Why do you write? Did you wake up one morning and decide that was what you wanted to do, or was it something that you had to progress into? What makes you keep on writing now that you have published a couple times and know all the hard work involved? I knew I wanted to be a writer from the time I was in the single digits – eight or nine at the latest. I simply loved the joy of putting words together to make up a story. My first attempt at getting published was in seventh grade, when I was twelve. I had written a full length book that was certainly pathetic but everyone praised it and my father hailed it as the next Great American Novel. My father was very good at ego-boosting. But no one knew how to go about getting published, so I went to my local Barnes and Nobles and asked them how. And instead of laughing, the bookseller took me to the writing section and I purchased the current edition of Writer's Market. From then on, no agent or publishing house was safe. I learned how to write query letters and regaled them all. And some of them sent personal letters back too, probably because I had included my age in the query letter and they either thought a) this kid has potential or b) this is sad and deserves at least a kind note. Now that I'm on my fourth novel, I've learned that publishing is 40% writing, 60% marketing and publicity. And - sadly - it's becoming this way for more and more authors (even the bigger names, who used to spend all their time writing). I try to find joy in every element of the publishing process since I know I am very fortunate to be doing what I love as a job. 8. Okay, and just because I always want to know, favourite reads of the year so far? (They don't have to be historical fiction). Ohhh... my favorite question! I devour as much narrative nonfiction as I do historical fiction. Some of my favorite reads this year have been Benjamin Wallace's THE BILLIONAIRE'S VINEGAR, THE SUSPICIONS OF MR. WHICHER by Kate Summerscale, THE LAST QUEEN by C.W. Gortner and Robin Maxwell's SIGNORA DA VINCI. Thanks Michelle for some great suggestions for books to add to my TBR list. I loved The Last Queen and will be sure to give the others a try. I love reading Michelle's interviews because they are always different and I always learn something new. How did I miss that she's going to be writing about the French Revolution next? How cool is that? I can't wait to see what aspect she takes on. Thanks! Michelle, I loved THE LAST QUEEN by C.W. Gortner and Robin Maxwell's SIGNORA DA VINCI! I am really excited that your next novel will be about the French Revolution. What an interesting interview. Thanks for asking some different questions. And I'm so excited to hear that Michelle is venturing into a different time period for her next novel. Michelle, your writing is just so engaging and fun to read. It's wonderful to hear that you have fun writing as well.